Patricia believes that a strong body is a requirement for a great life. When we move we create more energy, have increased vitality and a strong body will be the vehicle that will carry us into our dreams. Are you working so hard, or working out so hard, that the joy and enthusiasm have been stripped away? Patricia reminded us that it is our joy and our gratitude that will bring out the beauty in our life. Notice the next time you go to the gym or exercise – how are you feeling – before – during and after? Do you feel energized or depleted after the workout and before you start do you feel excited or already exhausted? Check in to make sure that your workout is a sense of motivation instead of deprivation. Where is your focus? Patricia talked about the strength of our thoughts, and as science is showing us – our thoughts will drive our focus and where our focus goes our life will flow. We are constantly having an internal dialog with ourselves and it often becomes such a part of our day that we do not even realize it is going on until it is too late. On the days or moments when all of a sudden you begin to feel a little down or out of sorts – when you are aware and alert you can interrupt the chatter and rewrite the script of your life to stay on course and moving toward the positive. Are you hammering the physical and neglecting the emotional and spiritual parts of your life? This was a question Patricia asked us to consider and perhaps over the next few days you can take time to sit and reflect to see if there is an area of your wellness wheel that could use some nurturing and TLC – to live a big, bold and beautiful life we need to take the time to make sure that we strengthen not only our bodies but our hearts and minds. 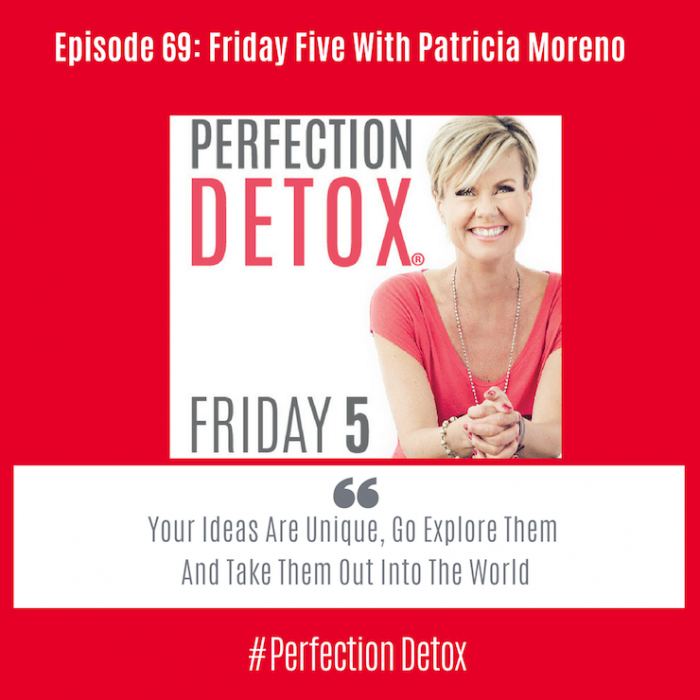 Moving Mountains through Action: Both Patricia and I see so many people asking the question – “who am I to be sharing my ideas with the world” and Patricia reminds us that there is nothing like action to shift out self-doubt. As she quoted in our conversation “Self-doubt creates mountains but action moves mountains” What is one action step you can start today to begin to get your momentum moving? Remember perfection is a lie and your struggles are your goldmine.